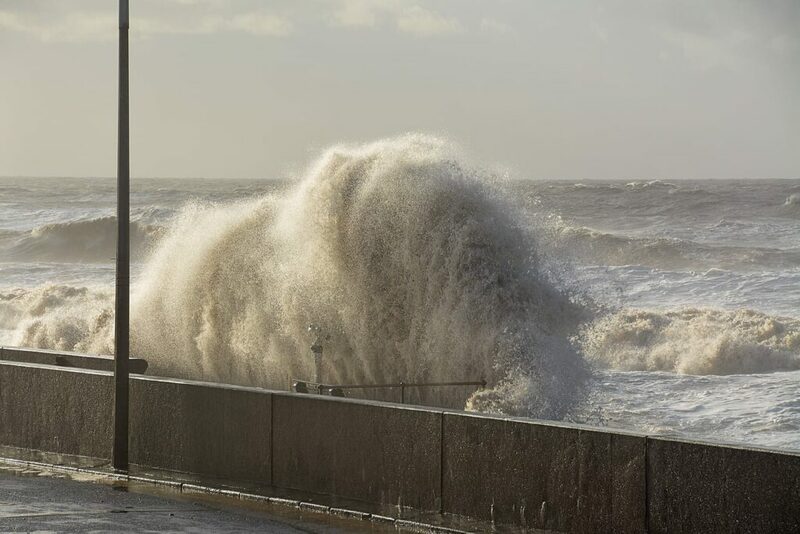 Storms, sea coming over and flooding are all part and parcel of life at the coast. 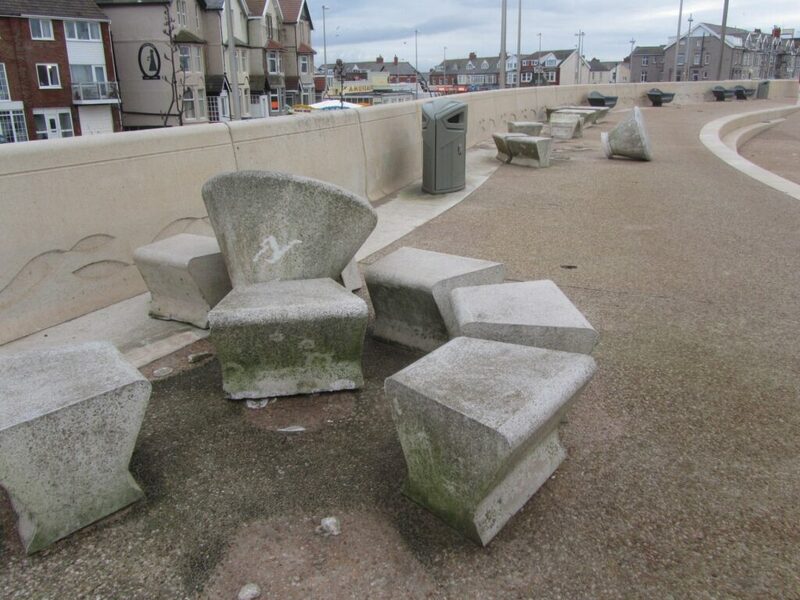 We are very fortunate on the Fylde Coast that we have well maintained and robust sea defences. Although the defences protect us to a good standard, they can never truly prevent any breaching from happening. 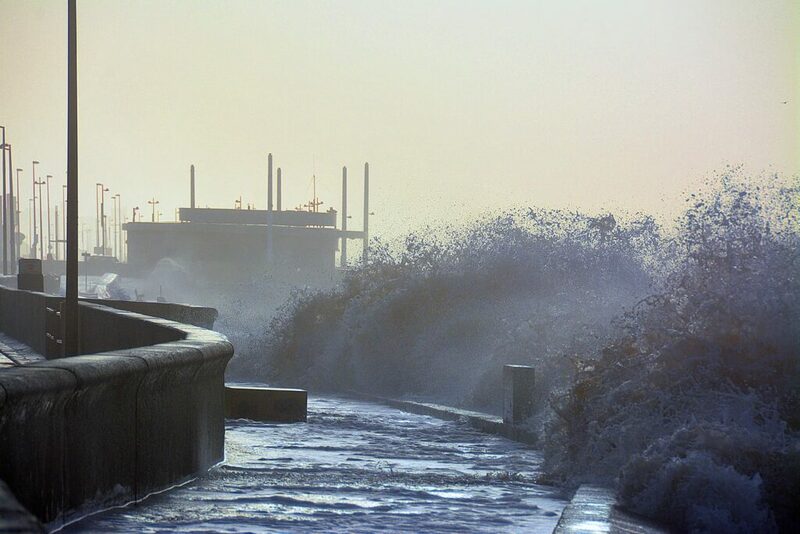 On 5/6 December 2013, severe storm conditions affected the whole of the UK. 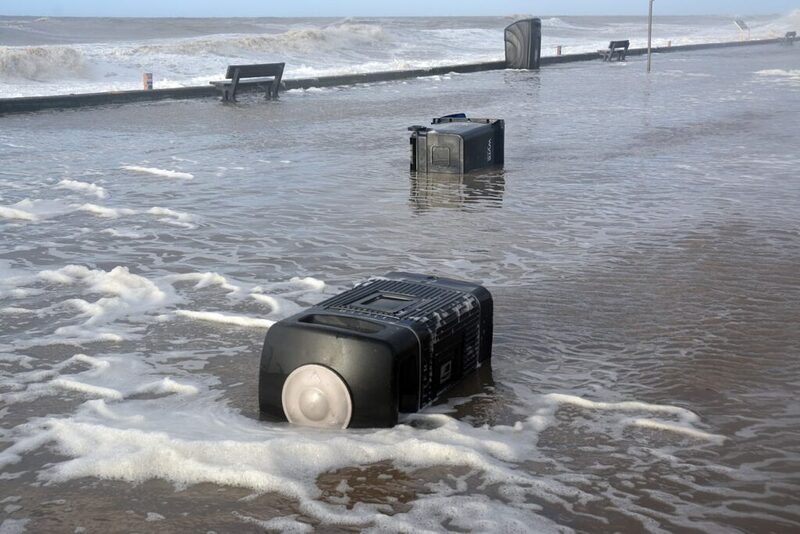 The east coast in particular was badly affected by storm surges. 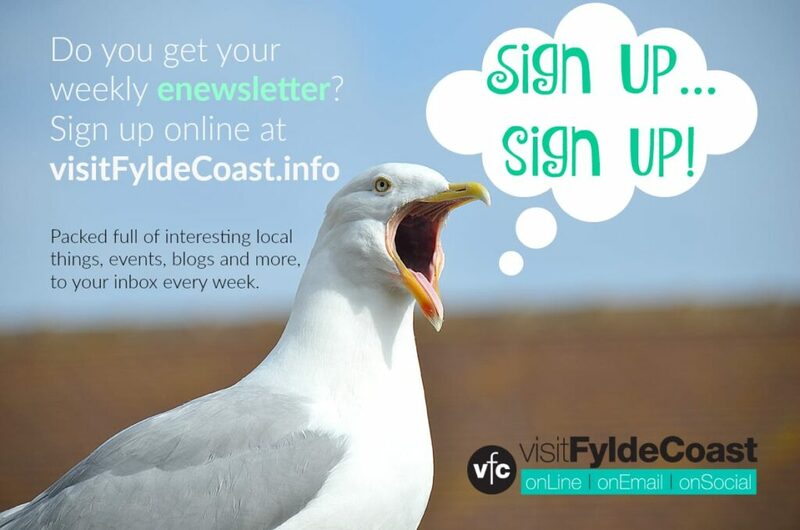 As is usual, Flood Alerts were issued by the Environment Agency for the Fylde Coast. 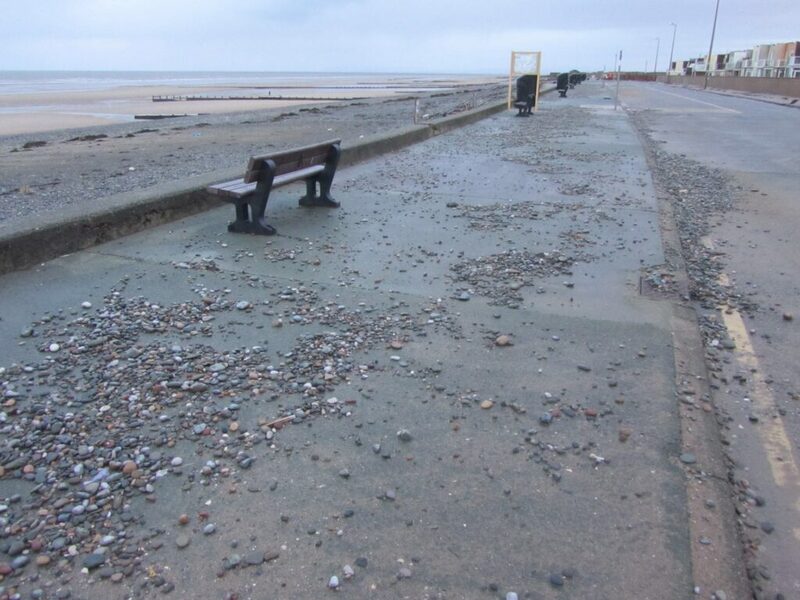 The whole of the area from Fleetwood to Blackpool was affected. 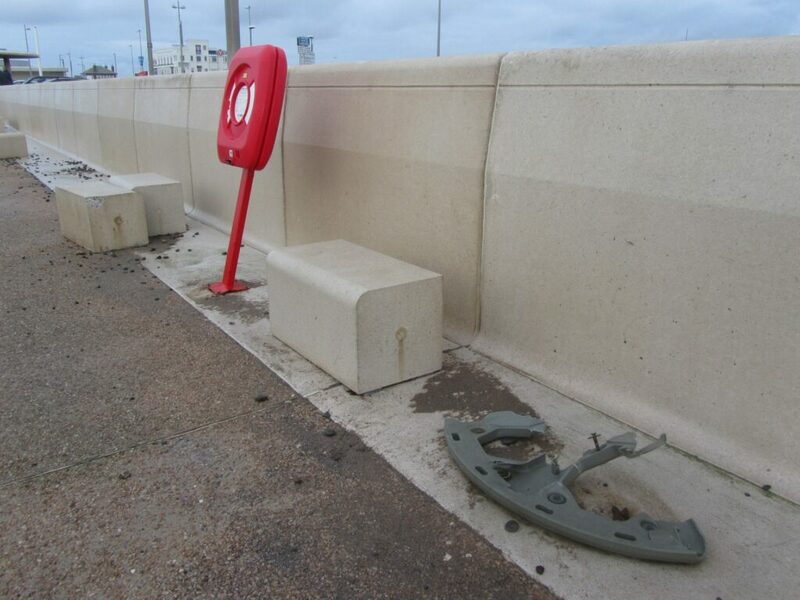 Flood gates were closed on the seafront and precautions taken against the high tides at midnight and noon. The wind started to get up at 5am on Thursday 5 December. By mid morning that day it was clear that there would be a problem at high tide at 12.20pm. 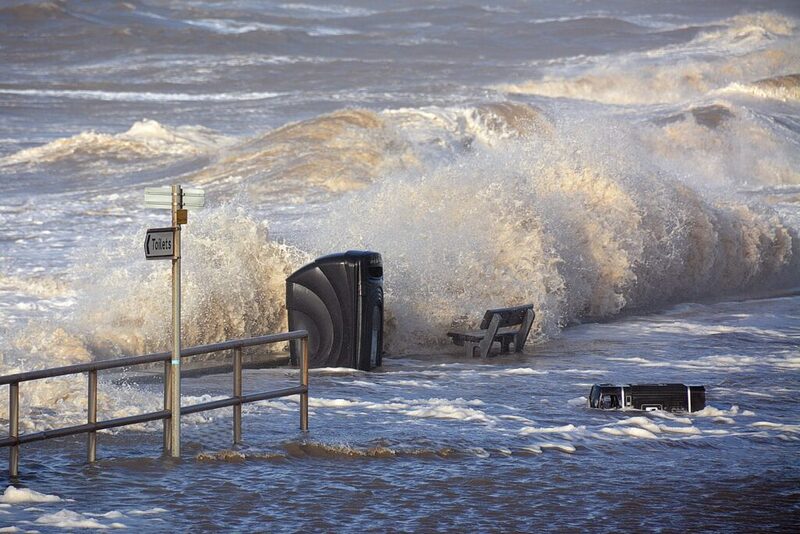 To make matters worse, it was also a high spring tide of 9.9m. 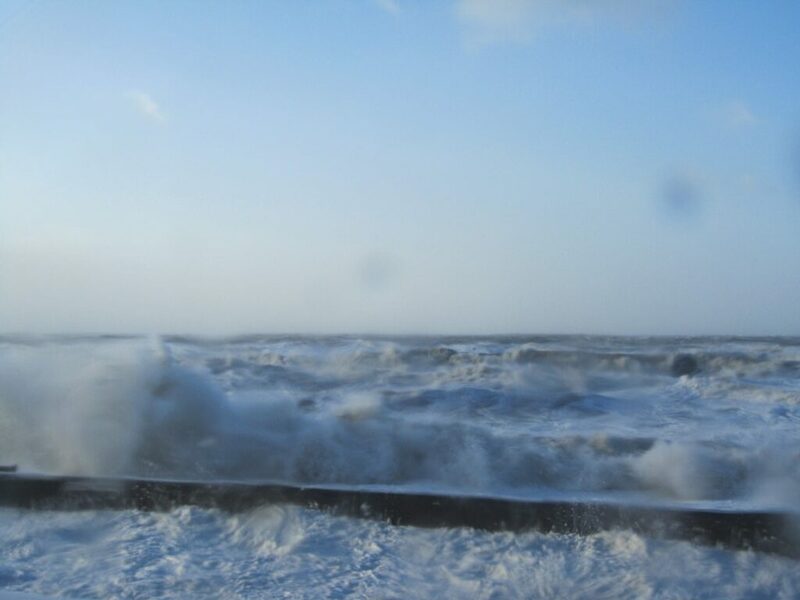 You could call it a perfect storm, with a combination of a high tide, a strong westerly wind blowing the sea to shore and low pressure systems. These three factors combine to create high waves, high water and flooding. 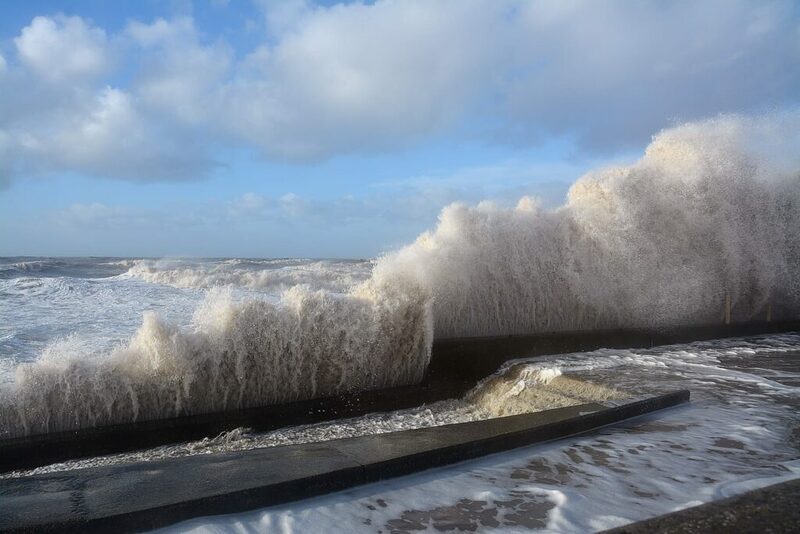 By 11am the foam was flying here at Cleveleys, the road covering with a deep mass of quivering jelly. 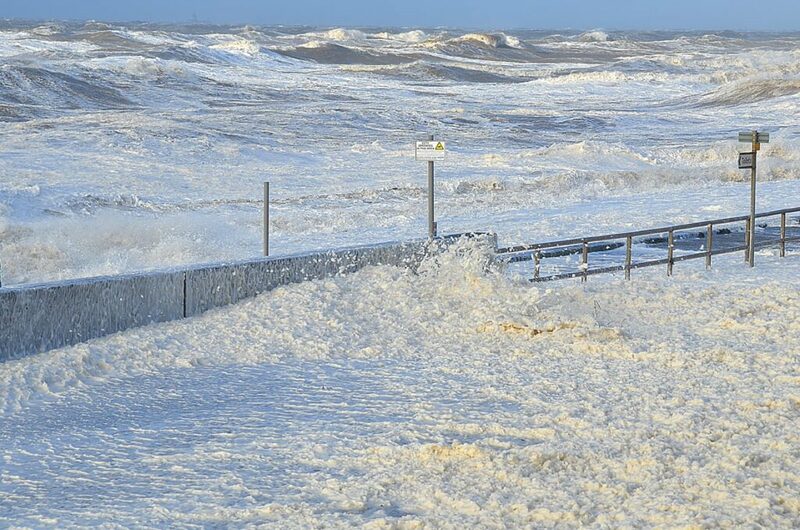 The foam is quite a spectacle, it’s caused by decaying algae in the seawater, agitated into a foam when conditions are right.  Read more about the sea foam here. 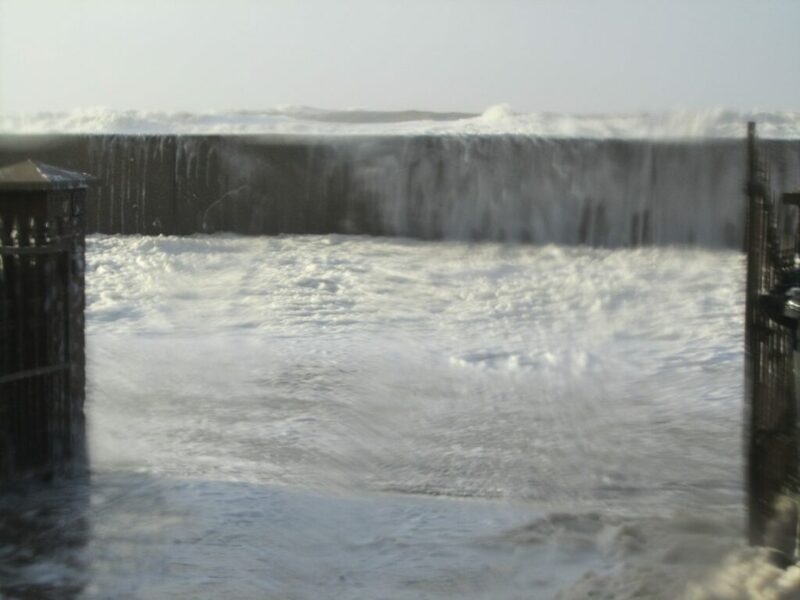 By 11.30am, waves were coming over the top of the new sea defences in front of Jubilee Leisure Park, and over the sea wall at Rossall Beach. 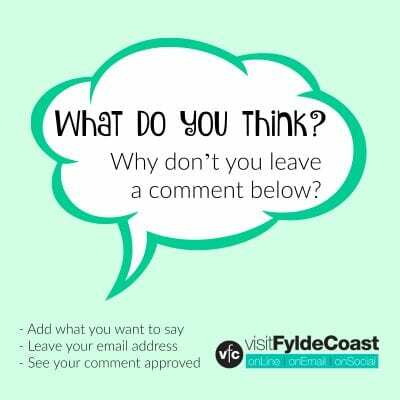 The promenade, and Jubilee Leisure Park car park was completely flooded. The force of the wind was easily 50mph. So the overtopping effects continued until about 1pm, although high tide was at 12.20. 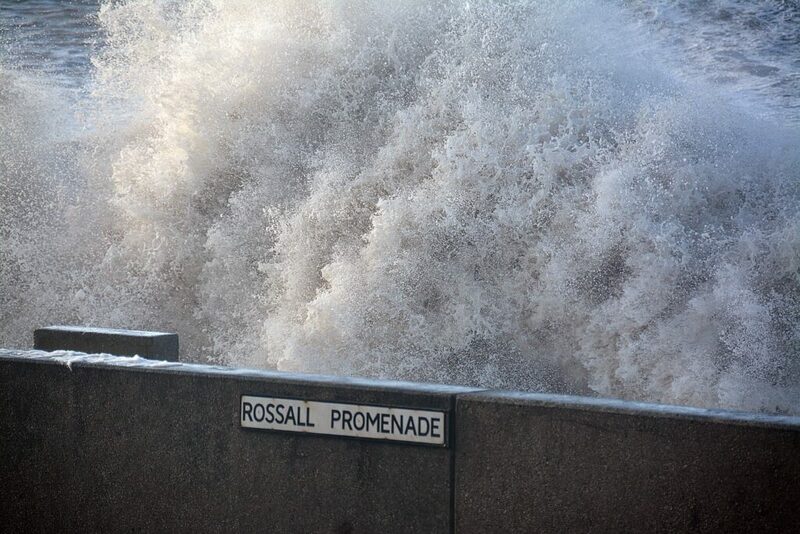 The sea water coming over the wall turned Rossall and North Promenade into a river, which flowed (as water does) to the lowest point. Which is straight into the lower lying garages of the seafront properties, and straight down Thornton Gate. Carrying, of course, the foam and rubbish with it. At Anchorsholme at the south end of Cleveleys, waves were well in excess of the height of the old brick wall against Anchorsholme Park as you can see in the next photo. 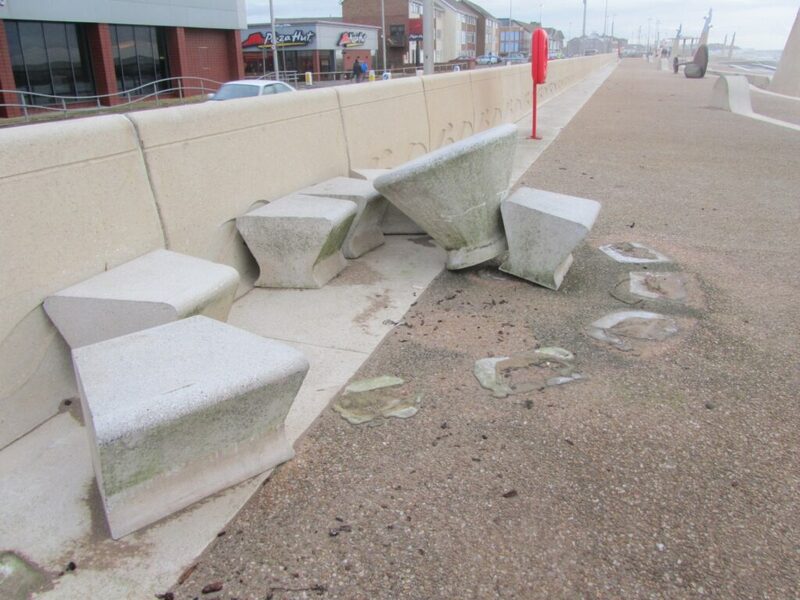 This is why the promenade at Princes Way has been rebuilt, because it is an area which is very prone to flooding. 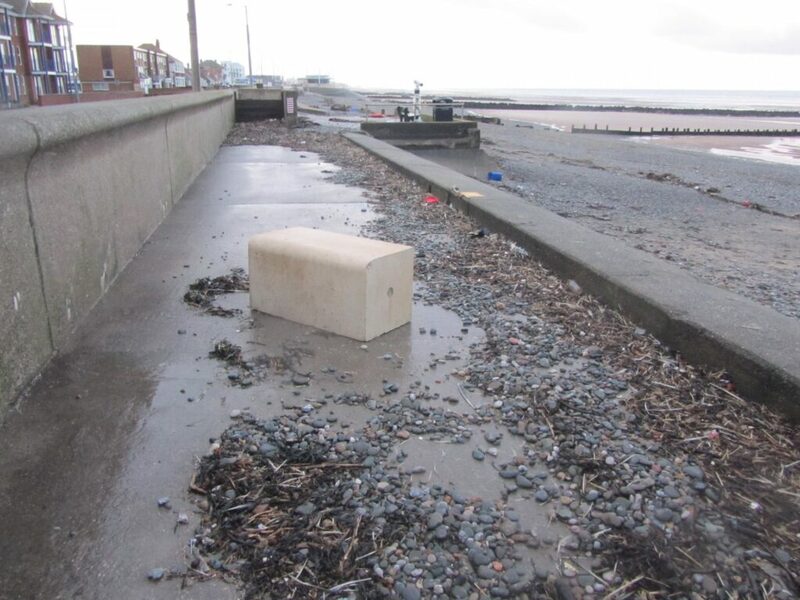 Once the high tide abated, all the devastation caused by the storm can be seen. 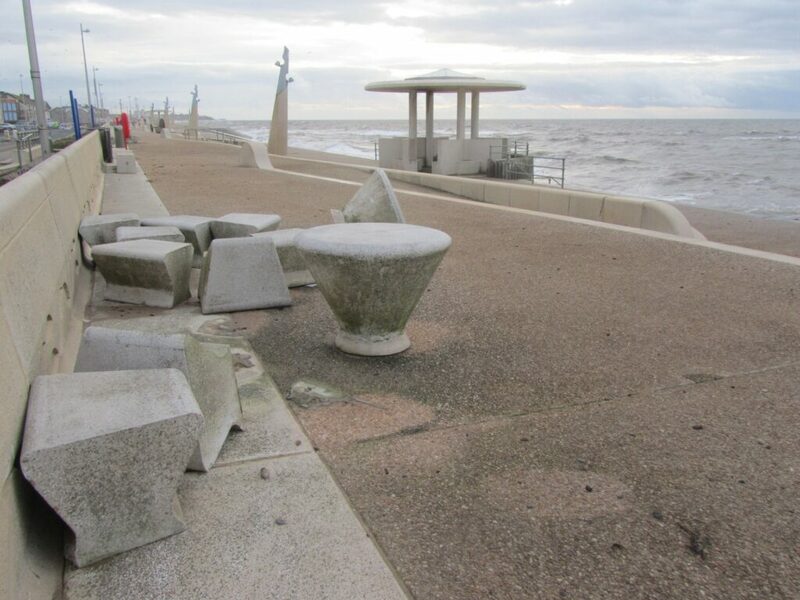 And yet another set of heavy concrete picnic tables picked up and thrown along the prom! 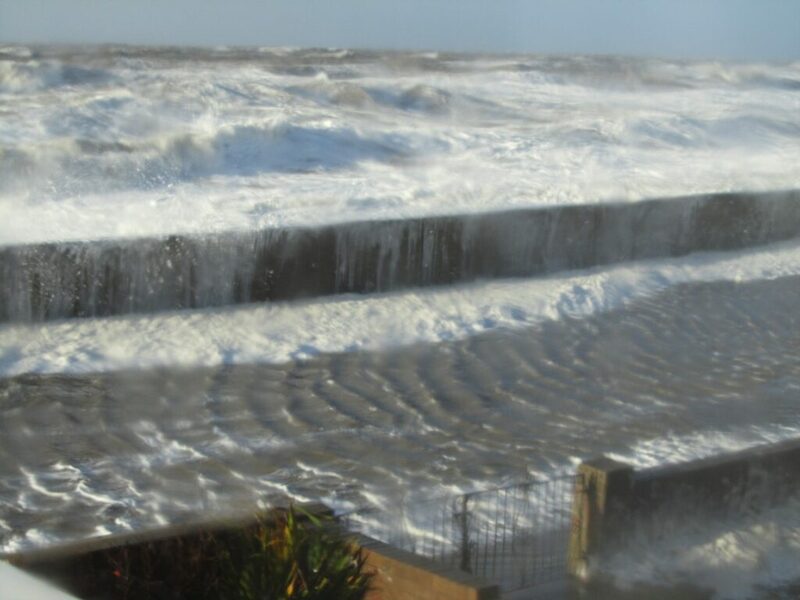 It was coming over along the wall along the length of the sea defences and caused considerable flooding. 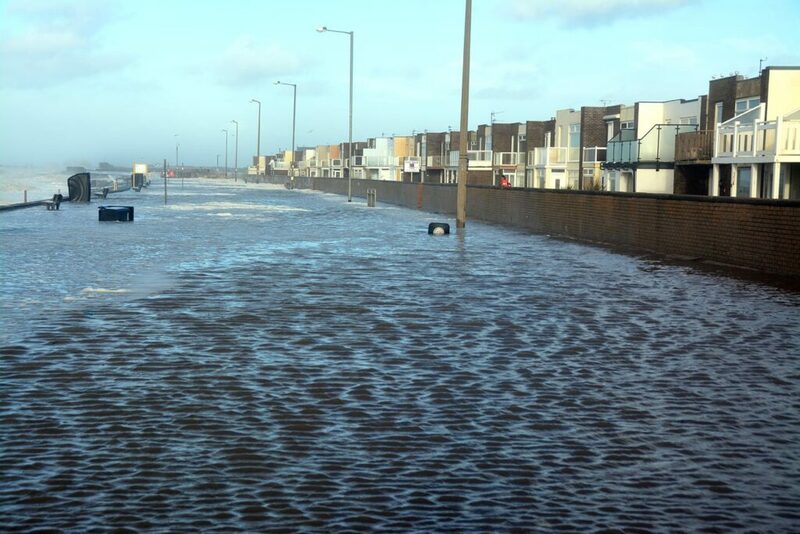 Thornton Gate in Cleveleys and the roads at the Anchorsholme end of town were covered in flood water as far back as the tram tracks. It’s not safe to go out hunting for photos in this kind of weather, so we rely on what we are told and the evidence afterwards. 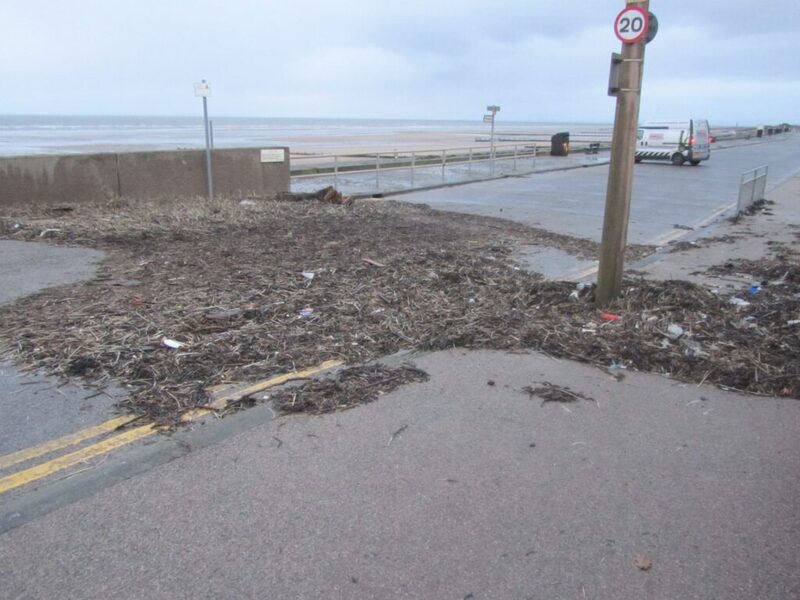 The parking area at Rossall Promenade was flooded with sea water. 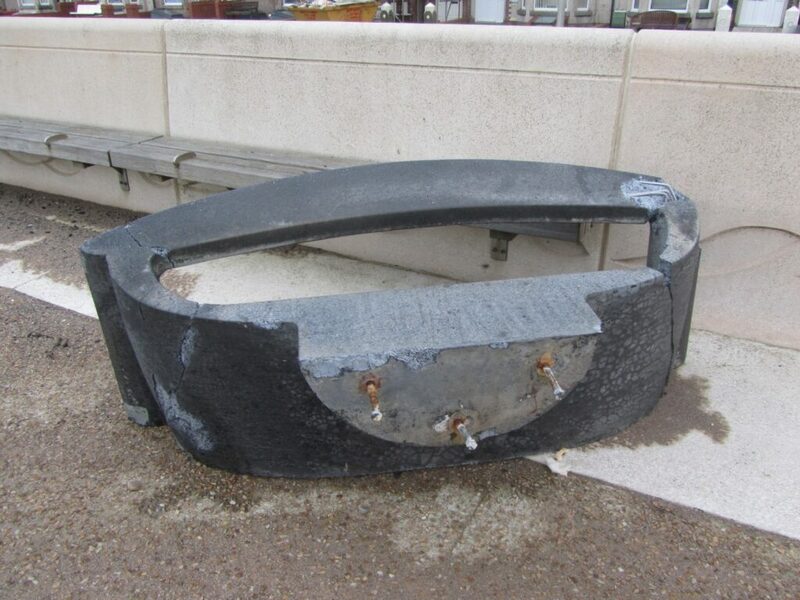 As the water drained away the debris that had come along with it was left behind. The next photo was taken after some of the clear up had already begun. 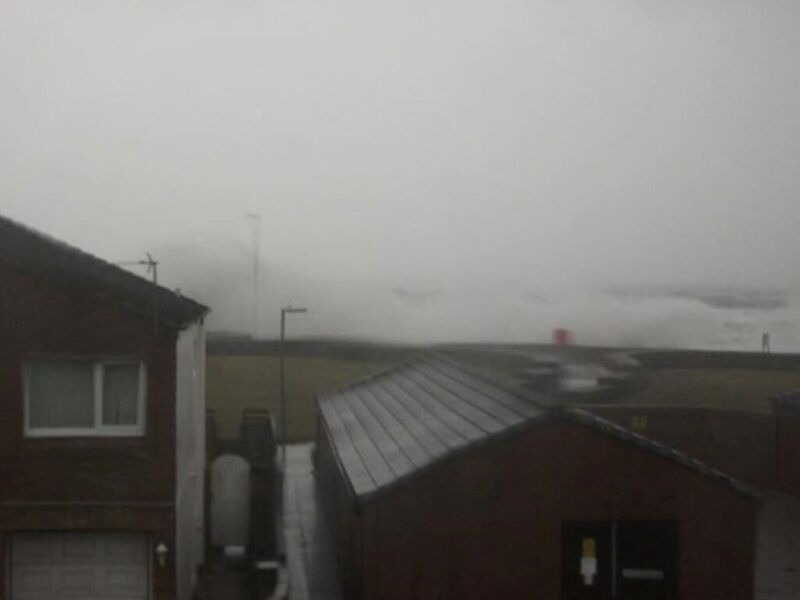 It doesn’t look that bad, until you consider that the sea doesn’t normally come anywhere near to the low sea wall, never mind over the top of it. 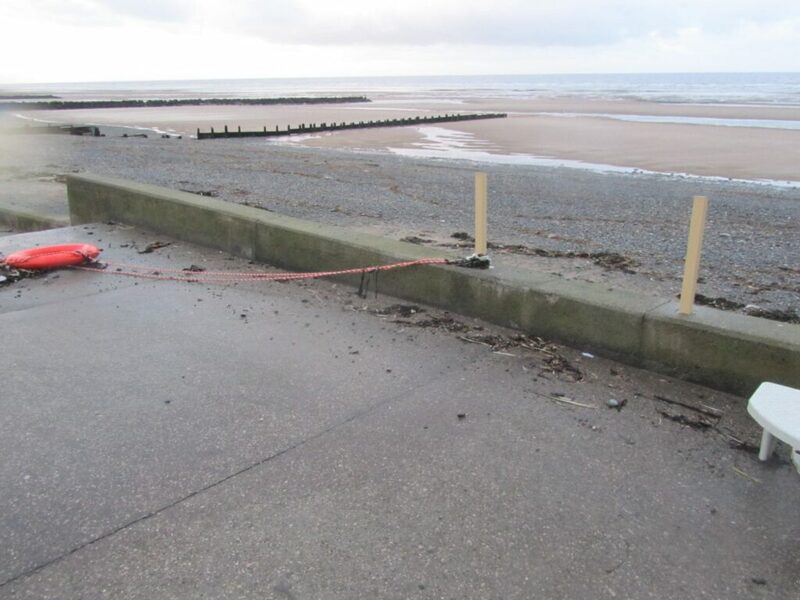 The beach at Rossall Promenade is considered to be one of the safest areas of sea defences on the Wyre Coastline. 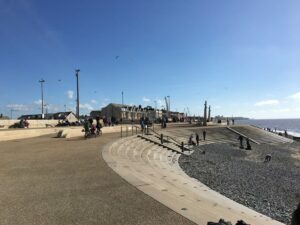 The natural, sloping shingle beach and curve of the coastline gives good resilience against high seas. Which just shows how bad this storm was. 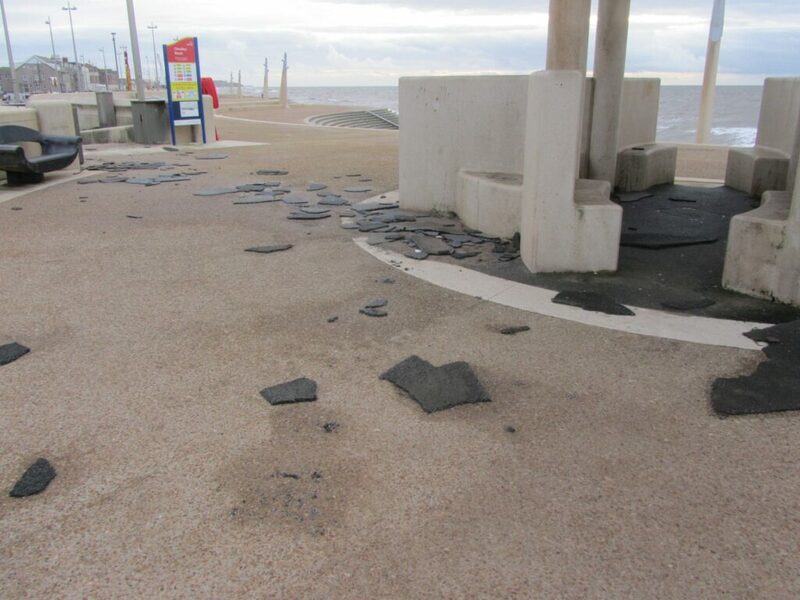 Our understanding here at Visit Cleveleys is that the storm of December 2013 was a one-in-200-year storm. That is to say the sort of severity that typically only happens once in every 200 years. But just as buses always come along together, probability doesn’t mean that you can’t have two bad storms back-to-back. This was proved when round two of the bad storms happened again on 3 January 2014.